This month for our Lazy Susan group the theme was 7 ingredients or less and healthy. The first thing that came to mind was a soup. You can make a rich and creamy soup with no cream, it feels decadent, when in actuality it is healthy and full of vegetables. When we lived in Canada, we used to go to a little place called Wheaton’s and they had the best carrot and ginger soup. I would crave it, and go at least once a week to get a cup. I think that I have figured out how they made it, and this soup is slightly exotic and full of flavor. You will never guess that it has little to no fat, and all of its richness comes from vegetables. The other beauty of a soup is that it is so filling. 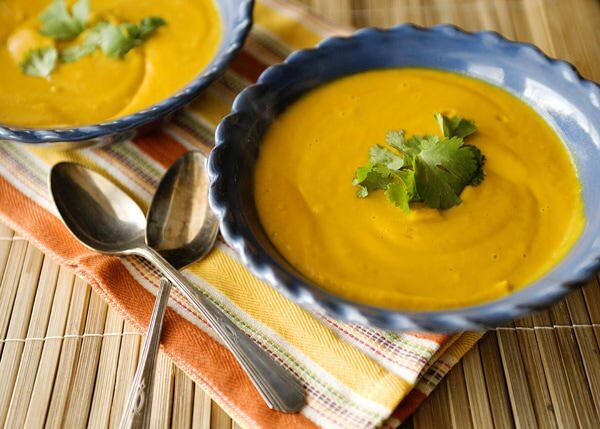 A big bowl of this carrot soup feels like a hearty meal, and is without guilt. This is not a specific recipe, more like a this what I have, and this is what I am using sort of thing. If you don’t like curry, try coriander or cumin. You could use butternut squash or another root vegetable. In the end, this is all going to get pureed together, so I was not concerned with making everything the same size, or grating the ginger. I will say, the smaller the dice of the carrot, the faster they will cook. I have a Vita-Mix, and it is amazing. One of the best features is that you can put hot liquid into it and the top will not blow off. If you are using a regular blender, let it cool down, puree it, then add it back to the saucepan and heat it up again. Otherwise you will and everything in your kitchen will be wearing orange. 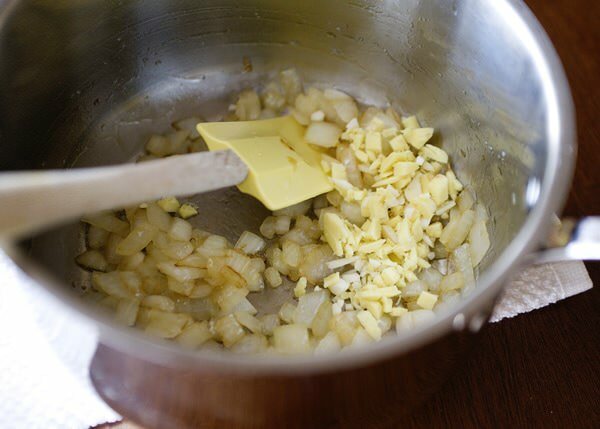 In a medium saucepan, cook the onion until it begins to soften and turn translucent, about 7 minutes. Add the ginger and curry powder. Cook for another minute. Add the carrots and cook for a few minutes until they begin to soften a bit. Add the coconut milk and vegetable stock. Season with salt and pepper. 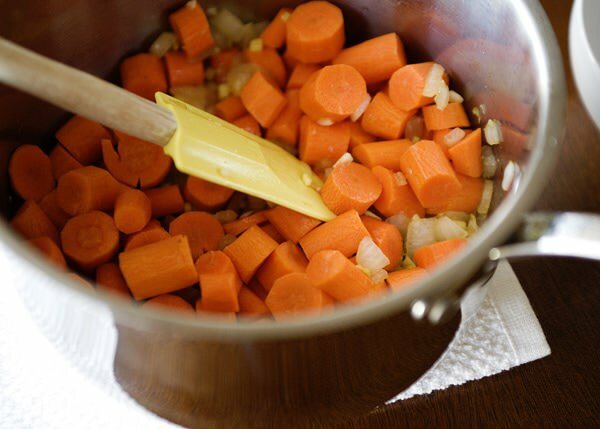 Simmer the carrots in the broth for 20 to 25 minutes, or until they are soft. Put the carrot mixture into a blender or use an immersion blender. Puree until very smooth. Pour into a bowl. I like to add a few cilantro leaves for freshness. Ready for the next recipe? Head on over to Chenin Boutwell’s Fudge Banana Swirl to see what she has made for us. It is pretty close, I love the coconut cake there too. gorgeous and delicious again Bree, this sounds perfectly wonderful! I hope that it is Sara! yum yum yum! i just started getting into making soups and this one is a must try! I make soup at least once a week. I love soup. Oh Bree! This looks awesome and my little Scout can eat it! Definitely going in my recipe box! It is really good, and easy. A winning combo in my book. Thank you so much Amy. Try taking them in an open door. Wheaton’s? Did you live in the Maritimes? I am from there! We did, we lived in Greenwood for 2 years. In fact, my daughter was born there. Neat! I live in Halifax currently. I made it with butternut squash. 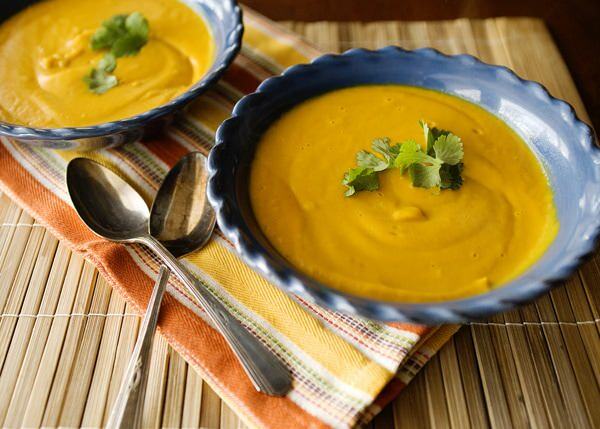 I have been wanting a butternut soup recipe. I love squash soup, that sounds delicious. Yum! This look delicious. I’ve never actually tried carrot soup before but this has made me want to try making it. I imagine it would be kind of sweet like Pumpkin soup? A little bit, but not too sweet. 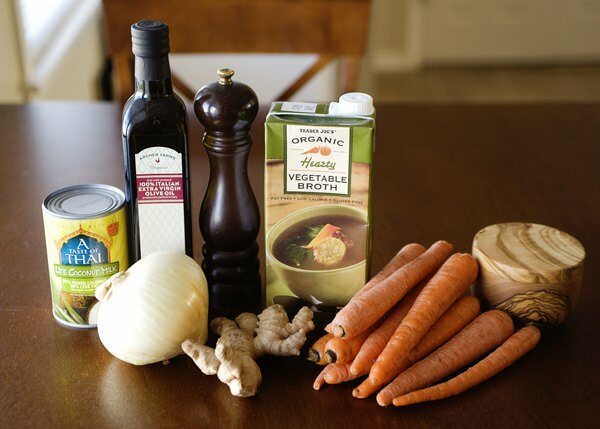 I love making soups but I have always found that carrott soups are a little too sweet for me. However, I like the idea of the curry flavour with the coconut milk with it and will give it a go! This is not sweet, I think that you will like this one. I did make the soup-posted in on to FB and loved it!!!! !Thanks again for sharing. glad that you liked it Holly. Hi Bree. First of all I have to say that I love your header with the little cups of chocolate drinks all garnished so beautifully. 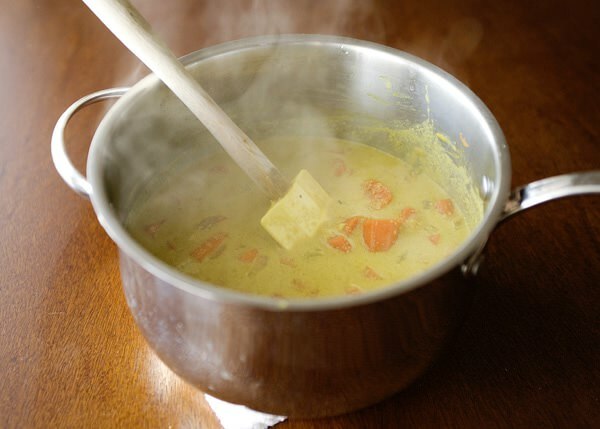 On the soup: I love carrot ginger though I have to get to making it more often myself. We keep Trader Joe’s boxed carrot ginger soup in the cupboard for busy nights, so I tend to just have it then. 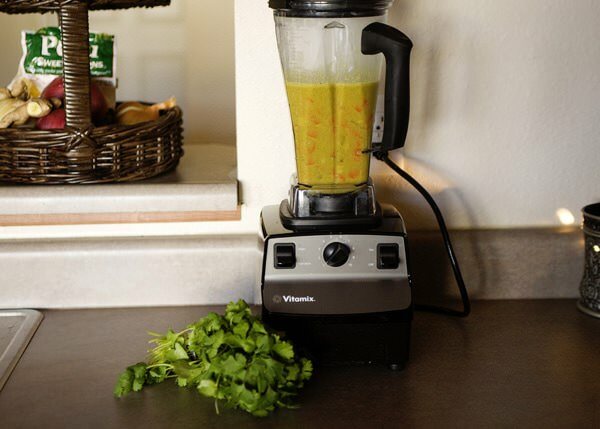 I, too, have a Vitamix and love it for a lot of things, but being able to process an entire batch of hot soup at once is one of its many virtues. I love my Vitamix! We use it almost every day. 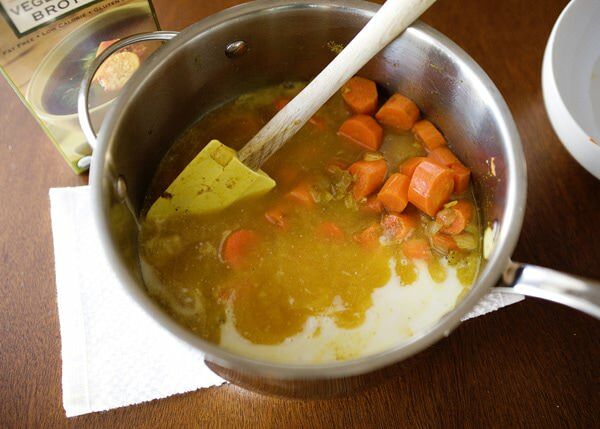 This soup looks marvelous and you have a lovely blog. You look like a young Annette Bening ~ really! thank you so much, you just made my day! I love this soup, it turned out better than I imagined! Thanks for sharing. I will definitely be making this again! I am so glad! So good for you too. I made this tonight with butternut squash because that’s what I had on hand (side note: I was actually planning to make your butternut squash soup, which I love, but then had a craving for a curried-coconut-gingered variety and lo and behold, you have a recipe for that too!) and it turned out very tasty! The only change I made was to add 1T of sugar to add just a touch of sweetness. I’m sure the carrots wouldn’t need it, or perhaps if my butternut squash was a little more ripened that would have negated the need as well. Thanks for another great recipe!